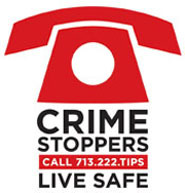 Crime Stoppers and the Houston Police Department’s Robbery Division need the public's assistance identifying the suspect responsible for a robbery bodily injury. As a result of the investigation by robbery detectives, the male has been identified and charged with robbery bodily injury and currently has an open warrant for his arrest. The female has yet to be identified.